Dainton's first foray into the world of oak saw the brewery create a beery version of the Manhattan cocktail for their friends at award-winning Melbourne bar, The Everleigh. It now has a stablemate, albeit one that in conception is about as far from the home of Woody Allen films, 12-piece blues bands playing subway stations, Strawberry Fields and the "I NEED MONEY FOR WEED" guy as you can get. This time around, Dan Dainton swaps the avenues of Manhattan for the battlements of Castle Grayskull and comes up with the glowing neon bedecked, wax-sealed Skeletor's Stout. 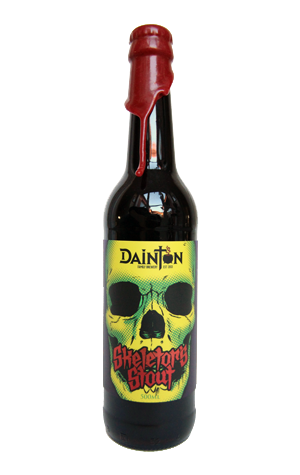 Entry two in what will be an ongoing barrel aged series (especially once Dainton's own brewery is up and running) is a stout that's spent "millennia" inside shiraz barrels and, boy, can you tell. It's not as big as most stouts that tend to get the oak treatment – most brewers seems to prefer to do it with imperial beers. And the choice of shiraz rather than, say, bourbon or whisky, is also less than common. The outcome is a beer that really lets the wine-soaked wood come to the fore: heaps of French oak and dark cherry fruitiness pour forth from its deepest, dark black realms, leaving any dark chocolate and roasted characters in a supporting role. There's a touch of leather and a hint of spicy booze in there too, plus a lingering, drying, roasty, tannic aftermath. To close out, we should probably quote Skeletor or He-Man here, but instead it's another character immortalised on the screen that comes to mind. Jeffrey Wigand – played by Russell Crowe in The Insider – described cigarettes as a "nicotine delivery system"; here it feels like the stout is the delivery system to bring every last gasp of oaky, winey-ness from the barrels.